Former Celtic goalkeeper Pat Bonner thinks the Parkhead side will reach the Champions League group stage if they beat Malmo 1-0 at home on Wednesday. The Swedish champions are in Glasgow for the first leg of the play-off tie. "If Celtic go to Sweden with one goal and a clean sheet, I think they will go through," said Bonner. "They're much more compact this year. That was the making of them in getting through the last round - a clean sheet at home. It's the key objective." 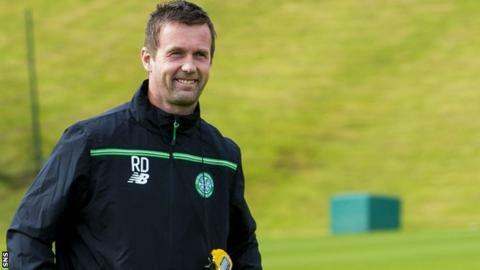 Celtic manager Ronny Deila has guided his team to three clean sheets in their four European matches this season, while domestically they have not conceded in two of their four matches. "I expect Celtic to score, but having that clean sheet sets them up for that second leg," Bonner told BBC Radio Scotland. "You've got to take the whole tie over the two legs. You can't just go out all gung-ho and try to score goals and then leave yourself open. "They proved against Qarabag in the last round that they can go there and defend. "The crowd is going to play a big part tonight. I'm sure it's going to be a full house and they will create that atmosphere that we love at Parkhead." Deila mentioned at his media conference on Tuesday that new signing Scott Allan might play a part against Swedish champions Malmo. The Norwegian also admitted that whether to start Nadir Ciftci was one of the main selection dilemmas he is facing. Turkish striker Ciftci has been serving a six-game domestic ban for biting. And, while the former Dundee United forward has been able to play in European games, he has not yet found the net. However, Bonner - who made over 500 appearances for Celtic - reckons this is definitely a match for using Ciftci. "They bought him to start," he added. "If they play a compact game, they need someone they can hit up front who can hold the ball up. "Leigh Griffiths has played well and scored goals, but I don't know if he can do the same job of holding it up and getting players up to support."